Singaporean bus drivers are becoming increasingly rare in the city-state, with migrant labour largely responsible for transporting many people to and from work each day. And in a similar fashion to many other industries the writing is on the wall. Bus driving is an occupation without a future in advanced societies. At Singapore’s Nanyang Technological University (NTU) students will soon get a better taste of the (very near) future when the second generation of a driverless bus begins operating between its campus and the CleanTech One industrial park, approximately 1.4km (0.87mile) away early next year. 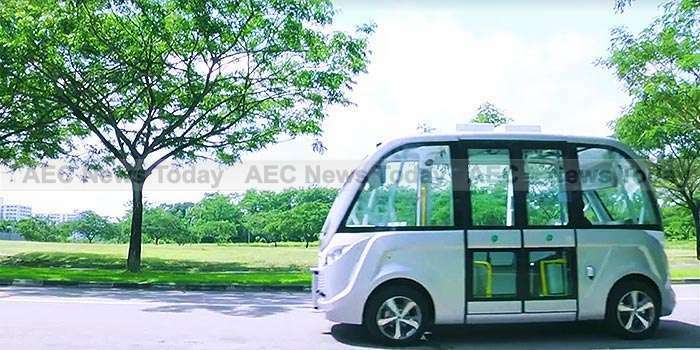 Although small, the second generation driverless bus, called Arma, is fully enclosed and air-conditioned, and according to its designers capable of transporting 15 passengers at speeds of up to 45kmh. It is projected to be fully operational at NTU early next year and follows the introduction of a self-driving golf cart introduced in 2013. Developed by French company Navya, Arma is equipped with four cameras and eight light radars to detect obstacles in its path. It also communicates its location via GPS to a base station enabling the location of the driverless bus to be monitored in real-time. The bus utilises electrical energy by induction and can last from five to 13 hours, depending on distance and traffic conditions. A full charge is expected to last for 130km (80.77 mile). With a price of between S$150,000 and S$300,000 (US$103,806-$207.612) the driverless bus costs between 77 and 144 times the monthly starting salary for a Singaporean or Singapore Permanent Residents (PR) holder joining SBS Transit, and between between 43 and 86 times that of an experienced bus captain. NTU also plans to trial two full-sized driverless buses in 2018, building the navigation software to control them on campus. With a solid reputation for its technological innovation and its eco-friendly campus, NTU was ranked 54th best globally in the Times Higher Education World University Rankings for 2016-2017 (See: Singapore Universities Unchallenged For Asean Education Hub Title), and was named the world’s fastest-rising young university by Times Higher Education in 2015. According to the Singapore Land Transport Authority (LTA) Facebook page, the trial route across NTU’s campus and CleanTech One industrial park may be extended to the nearby Pioneer train station at a later date.